Hi friends! I hope you're having a great day! We had a good day. Parker went to school and had tons of fun while I took Brady on a mommy and me date. We went to breakfast and then shopping for the snacks that he'll bring to school next week. It was a nice day. Here's a card I made for my pal Suzanne's Dare to Get Dirty challenge. I used stamps from Paper Smooches Pretty Mama. The paper is from Echo Park and the ribbon is from my stash. Super cute, Ash! 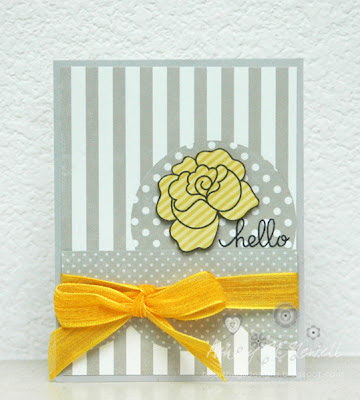 Love the pop of yellow! Such an awesome color combo and card!!! SWEET!!! Super pretty! Love the ribbon and the colors!